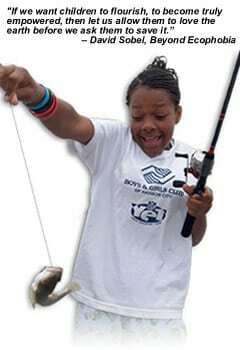 The Hooked on Fishing Not on Drugs (HOFNOD) program is the flagship youth education program of the Foundation. The program, developed 20 years ago, has been recently updated. HOFNOD uses angling skill development as a gateway to teach youth about the benefits of a healthy lifestyle and how to deal with the challenges facing them in their young lives. The HOFNOD network includes trained aquatic education professionals in over 30 states with literally thousands of programs nationwide. Connect with a HOFNOD coordinator near you and help America’s youth get Hooked on Fishing and Not On Drugs! Connect with your local community groups that work with youth. Become a HOFNOD trained instructor. Or, you can attend a one-day HOFNOD instructor training course when/where they are scheduled. IN the online training and at the HOFNOD instructor training workshop, you will learn many activities and lessons that are appropriate for helping young people learn to become ethical anglers and also to grow into adults that will make wise decisions for themselves and the environment. In addition, you will then have the ability to use the Hooked On Fishing – Not On Drugs® name and logo. This course will give you the skills you need to lead a mentor-based fishing or boating program that will make a difference in children’s lives. Contact the Foundation to find a HOFNOD instructor training course in your area.